On April 15, 1983, the quick service restaurant Royal Street Veranda opened in Tokyo Disneyland’s Adventureland area. Sponsored by Kirin, this juice bar provides Kirin lemon soda, apple tea soda, and mix orange soda. The stop also features specialty candy and decorated cases. Posted in Uncategorized and tagged 1980s, Disney Park, International, Quick Service, restaurant, Tokyo Disneyland. Bookmark the permalink. On April 12, 1992, the quick service restaurant Last Chance Café opened in Disneyland Paris’ Frontierland area. The restaurant features Western-themed fare such as pork sausage with Cajun spices, chicken wings, and potatoes with chili con carne. Posted in Uncategorized and tagged Disney Park, 1990s, International, restaurant, Disneyland Paris, Quick Service. Bookmark the permalink. On December 12, 2003, the quick-service restaurant Nautilus Galley opened in Tokyo DisneySea’s Mysterious Island area. Built across from Captain Nemo’s submarine, this restaurant keeps in the theme of the area and offers snacks and drinks for guests to enjoy. Menu items include an assorted snack bowl, gyoza dogs, and assorted drinks. The menu also includes specialty items for the park’s events, such as items for Christmas and Halloween. Posted in Uncategorized and tagged 2000s, Disney Park, International, Quick Service, restaurant, Tokyo Disneysea. Bookmark the permalink. On April 6, 1990, the Blue Ribbon Bakery quick service shop opened in Disneyland on Main Street. The shop took the place of the long-running Sunkist Citrus House, which had opened on July 31, 1960, and closed on January 3, 1989. The bakery served several kinds of pastries with coffee for breakfast, and a variety of sandwiches for lunch, along with several Disneyland-famous desserts for any time of day. The bakery was moved to where the former Carnation Ice Cream Parlor was located in 1997, and eventually was closed on January 5, 2012. Posted in Uncategorized and tagged 1990s, Closed, Disney Park, Disneyland Park, Quick Service, restaurant. Bookmark the permalink. 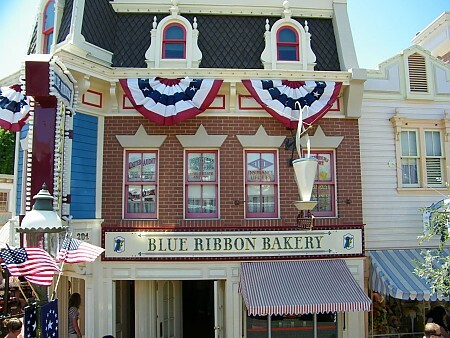 On April 6, 1990, the Blue Ribbon Bakery opened on Disneyland’s Main Street. The quick service bakery replaced the Sunkist Citrus House, which closed in early 1989 after opening in 1960. The bakery specialized in specialty pastries and coffee, including the Matterhorn Macaroon and the Soundsational Cupcake. In 1997, the bakery was moved to the location of the former Carnation Ice Cream Parlor; on January 5, 2012, the Blue Ribbon Bakery was officially closed, with its space being used as an expansion for the Carnation Café. Pastry lovers are now able to go to Jolly Holiday Bakery on Main Street. Posted in Uncategorized and tagged 1990s, Closed, Disney Park, Disneyland Park, Quick Service. Bookmark the permalink. On December 16, 1990, The Commissary restaurant opened in Hollywood Studios. The quick-service restaurant is decorated in an Art Deco style, reminiscent of the style of Old Hollywood. Its menu features popular dishes such as a chicken club, New York strip steak, and roasted salmon. 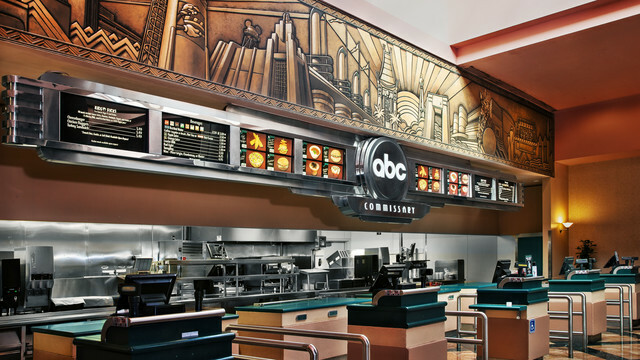 On July 1, 1997, the restaurant was renamed ABC Commissary, named after the Disney owned television channel, and features trailers and behind-the-scenes looks of popular ABC shows on its many television screens. Posted in Uncategorized and tagged 1990s, Disney Park, Hollywood Studios, Quick Service, restaurant, Walt Disney World. Bookmark the permalink.